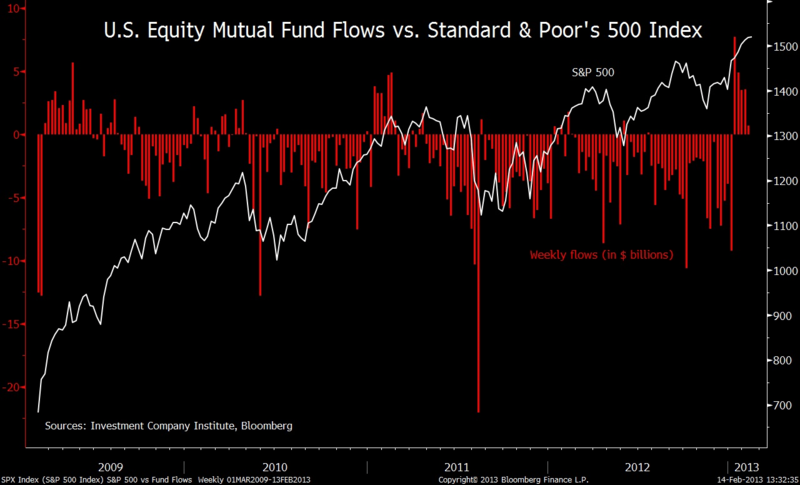 Stock Market growth has been tied to mutual fund growth since the late 1980s when Mutual Funds began to take over as the primary investment vehicle for individual investor’s retirement accounts. Fast forward to 2011 and the correlation seems to be broken. This is pretty significant and means that equity is being allocated to other investment vehicles and there are other investment vehicles driving the market growth. Foreign investments, ETFs, Hedge Funds, Pensions, individual stock purchases, ESPP investments, etc. All potential changes to investor behavior that is driving this change in what drives the stock market’s performance. The important thing to note about this macro change is that the things that used to drive changes in the market – namely mutual fund managers making decisions based on career risk – are changing and the overall performance of the market will adjust accordingly.